Love this bedspread and so did my husband when I unwrapped it. It has a luxurious and expensive feel. The colors complement the log bed frame and the western rustic log cabin decor. Great purchase. Experience the incredibly soft and luxurious 3 inch thick pile of this beautiful Legacy Home longhair sheepskin faux sheepskin bedspread. It features a extremely authentic natural appearance and genuine fur feel while offering high quality and durability for years of use in your home. 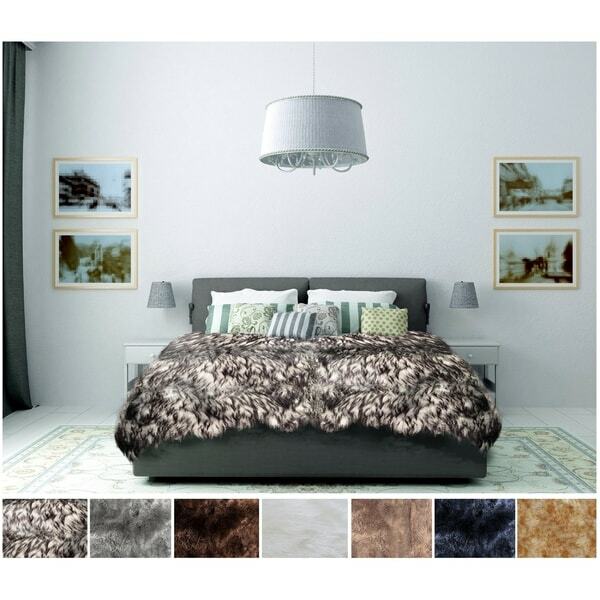 This gorgeous faux sheepskin bedspread will add warmth, comfort and style to your bedroom and is available in seven natural colors that will coordinate easily with a wide range of decor and accessories. Dimensions 120.0 In. X 80.0 In. X 3.0 In. Absolutely beautiful. Has a very lux sheepskin softness and is super warm. Nice option to standard bedding. No too yellow, a nice earthy cream. Highly recommend this purchase. I absolutely love this bedspread. It is super warm and soft! I highly recommend it but it will make it that much harder getting out of bed from the added comfort. This is a really large and nice faux fur. It is very heavy so it can be really warm during the night. Overall I love it. It holds up very well. "Is this product or any fur product that this company sells actual animal fur? Or does it have animal fur in the material? Reason I ask is my kiddo has animal allergies therefore I really need to know. Thank you." No, this is made of faux fur. "Are the colors Grey Mist and Sable corrected on website? What is exactly the color on the bed?" "Hello, what is the name of the color comforter that is shown in the first picture that is on the bed? It's not labeled/identified on the pic. Also, it looks as if the pics of the grey mist and sable are transposed? How does a customer know which is the accurate one that they would be ordering? I have noticed this numerous times on your website and unfortunately, the customer has to pay for returns if the wrong one is sent to them because of labeling errors :( Thank you in advance for your time." The color of the comforter on the bed is grey mist and the carousel of colors beneath the first picture are correctly labeled. The pictures that you click on to choose your color are transposed. (Grey Mist and Sable). We will work on getting this fixed. Thank You for bringing this to our attention. "What are the measurements on the king size blanket?" Approximately 118 inches wide x 120 inches long.